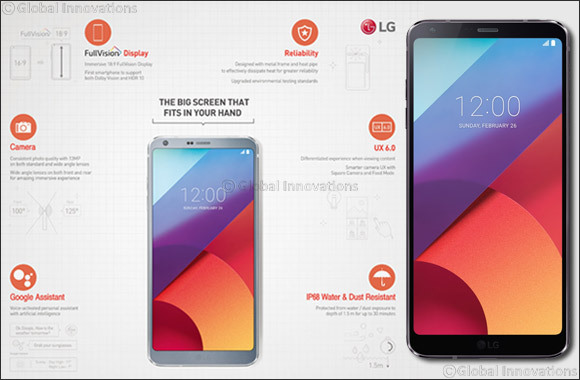 Dubai, UAE, February 28, 2017: LG Electronics (LG) today unveiled the G6 smartphone, the newest smartphone that features a bold new display format complimented by a cinematic viewing experience, exceptional screen to body ratio, wide angle camera and more. De-signed in response to consumer feedback and user opinions, the G6 is a back-to-basics approach to premium smartphones, with a focus on the features consumers want, most notably a big screen that actually fits in one hand. The LG G6 comes with a 5.7-inch QHD+ (2,880 x 1,440 resolution) FullVision display, and for the first time ever in a smartphone, an 18:9 screen aspect ratio. Compared to conventional 16:9 aspect ratio displays, the 18:9 format offers more viewing space and a more immersive experience when streaming videos and playing games. In a G6 Game Collection promotion for G6 buyers, in-game content with a retail value of up to a total of US$200 for six games – Temple Run 2, Spider-Man Unlimited, Crossy Road, SimCity BuildIt, Cookie Jam and Genies & Gems – on Google Play, are offered for free. The games take full advantage of the G6’s immersive FullVision display and sin-gle-handed ease of use. Even with the large screen featured on the G6, the smartphone is easy to hold. And un-like other phones with a similar screen size, the LG G6 fits comfortably in one hand, giving you a big screen experience without the inconvenience of a big phone. In fact, ergonomics research teams led by Dr. Andris Freivalds at Pennsylvania State University and Dr. Ji Yong-gu at Yonsei University tested the LG G6 for stability when holding the phone, comfort in various postures and actions, as well as muscle fatigue when using the smartphone for long periods. The LG G6 received the highest marks in all test categories. With the LG G6, you don’t need to ask people in the picture to reposition, cram together or find another place to stand in order to get everything in, simply choose between standard and wide angle settings. And with dual 13MP rear cameras, including a 125-degree lens on the wide angle, the LG G6 captures panoramic shots that regular phones cameras can’t. The G6 delivers an outstanding and unique camera experience by creating seamless transitions when zooming in and out between the wide-angle and standard camera lenses even during 4K video capture. The G6 also comes with an ex-panded 100-degree field of view with its 5MP front camera, which means users can take selfies or wefies without the need for a selfie stick. Plus, the wide angle camera reduces edge distortion, which makes for more natural images. And to view selfies, wefies, wide angle pictures and even the ones in the new Square Camera Mode, recent LG G6 photos appear in one window in film mode which means users don’t need to move to their gallery to review them. The G6 provides a Square Camera function which divides the 18:9 ratio display into two identical squares. The LG G6 can also take perfectly square photos in 1:1 ratio, ideal for Instagram, Snapchat and other social media apps. Users can also choose other ratios, such as 4:3, 16:9 and 18:9. Users can also take pictures in 1:1 ratio in one window, while checking, editing and up-loading pictures in another window immediately after shooting. What’s more, users can create GIFs by combining between 2 and 100 photos from the gallery. The LG G6 can go just about anywhere without worry thanks to its IP68 water and dust resistance that makes it safe to be immersed in up to 1.5 meters of water for as long as 30 minutes. And you can worry less about accidental drops and other rough environ-ments during everyday use because the LG G6 has been designed and built to be de-pendable even when the going gets rough. The LG G6 has Google Assistant built-in. LG worked closely with Google to make sure the Google Assistant experience is great right out of the box. It works seamlessly and intuitively with LG apps, empowering users to get fast answers, manage everyday tasks, enjoy the best music and videos and search the G6 more quickly and efficiently than ever. And with the remote after-service utilizing artificial intelligence, the more Google Assistant is used, the more personalized it becomes because it knows more about the user.